The chariot is the earliest and simplest type of carriage, used in both peace and war as the chief vehicle of many ancient peoples. Chariots were built in Mesopotamia as early as 3000 BC. The original chariot was a fast, light, open, two or four-wheeled conveyance drawn by two or more horses hitched side by side. The car was little else than a floor with a waist-high semicircular guard in front. The chariot, driven by a charioteer, was used for ancient warfare during the Bronze and Iron Ages, armor being provided by shields. The vehicle continued to be used for travel, processions and in games and races after it had been superseded militarily. Militarily, the chariot became obsolete as horse breeding efforts produced an animal that was large enough to ride into battle. The word "chariot" comes from Latin carrus, which itself was a loan from Gaulish. A chariot of war or of triumph was called a car. In ancient Rome and other ancient Mediterranean countries a biga was a two-horse chariot, a triga used three horses and a quadriga was drawn by four horses abreast. Obsolete terms for chariot include chair, charet and wain. The critical invention that allowed the construction of light, horse-drawn chariots for use in battle was the spoked wheel. Cavalry had been in use in Central Asia since 3000 BC and eventually replaced chariotry (the part of a military force that fought from chariots). The earliest spoke-wheeled chariots date to ca. 2000 BC and their usage peaked around 1300 BC (see Battle of Kadesh). Chariots ceased to have military importance in the 4th century BC, but chariot races continued to be popular in Constantinople until the 6th century CE (AD). The chariot probably originated in Mesopotamia about 3000 BC. The earliest depiction of vehicles in the context of warfare is on the Standard of Ur in southern Mesopotamia, ca. 2500 BC. These are more properly called wagons or carts, still double-axled and pulled by oxen or tamed asses before the introduction of horses ca. 2000 BC. Although sometimes carrying a spearman along with the charioteer (driver), such heavy proto-chariots, borne on solid wooden wheels and covered with skins, may have been part of the baggage train (e.g., during royal funeral processions) rather than vehicles of battle in themselves . The Sumerians had also a lighter, two-wheeled type of chariot, pulled by four asses, but still with solid wheels. The spoked wheel did not appear in Mesopotamia until the mid-2000s BC. The earliest fully developed chariots known are from the chariot burials of the Andronovo (Timber-Grave) sites of the Sintashta-Petrovka culture in modern Russia and Kazakhstan from around 2000 BC. This culture is at least partially derived from the earlier Yamna culture. It built heavily fortified settlements, engaged in bronze metallurgy on a scale hitherto unprecedented and practiced complex burial rituals reminiscent of Aryan rituals known from the Rigveda. The Sintashta-Petrovka chariot burials yield spoke-wheeled chariots. The Andronovo culture over the next few centuries spread across the steppes from the Urals to the Tien Shan , likely corresponding to early Indo-Iranian cultures which eventually spread to Iran , Pakistan and parts of India in the course of the 2nd millennium BC. Chariots figure prominently in Indo-Iranian mythology. Chariots are also an important part of both Hindu and Persian mythology, with most of the gods in their pantheon portrayed as riding them. The Sanskrit word for a chariot is ratha, a collective to a Proto-Indo-European word for "wheel" that also resulted in Latin rota and is also known from Germanic, Celtic and Baltic. The oldest testimony of chariot warfare in the Ancient Near East is the Old Hittite Anitta text (18th century BC), mentioning 40 teams of horses (40 ?Í-IM-DÌ ANŠE.KUR.RA?I.A) at the siege of Salatiwara. Since only teams are mentioned rather than explicitly chariots, the presence of chariots in the 18th century BC is considered somewhat uncertain. The first certain attestation of chariots in the Hittite Empire dates to the late 17th century BC (Hattusili I). A Hittite horse training text survives, attributed to Kikkuli the Mitanni (15th century BC). The Hittites were renowned charioteers. They developed a new chariot design that had lighter wheels, with four spokes rather than eight, and which held three warriors instead of two. It could hold 3 warriors as the wheel was placed in the middle of the chariot and not at the back as in the Egyptian chariots. Hittite prosperity largely depended on their control of trade routes and natural resources, specifically metals. As the Hittites gained dominion over Mesopotamia, tensionsflared among the neighboring Assyrians, Hurrians and Egyptians. Under Suppiluliuma I, the Hittites conquered Kadesh and eventually the whole of Syria . The Battle of Kadesh in 1299 BC is likely to have been the largest chariot battle ever fought, involving some five thousand chariots. The chariot, together with the horse itself, was introduced to Egypt by the Hyksos invaders in the 16th century BC and undoubtedly contributed to their military success. In the remains of Egyptian and Assyrian art there are numerous representations of chariots, from which it may be seen with what richness they were sometimes ornamented. The chariots of the Egyptians and Assyrians, with whom the bow was the principal arm of attack, were richly mounted with quivers full of arrows. The Egyptians invented the yoke saddle for their chariot horses in ca. 1500 BC. The best preserved examples of Egyptian chariots are the four specimens from the tomb of Tutankhamun. The Persians succeeded Elam in the mid 1st millennium. They may have been the first to yoke four horses (rather than two) to their chariots. They also used scythed chariots. Cyrus the Younger employed these chariots in large numbers. Herodotus mentions that the Libyans and the Indus satrapy supplied cavalry and chariots to Xerxes the Great' army. However, by this time cavalry was far more effective and agile than the chariot, and the defeat of Darius III at the Battle of Gaugamela (331 BC), where the army of Alexander simply opened their lines and let the chariots pass and attacked them from behind, marked the end of the era of chariot warfare. In the Armenian Kingdom of Van (Urartu), the chariot was used by the nobility and the military. In Erebuni (Yerevan ), Armenia King Argishti of Urartu is depicted riding on a chariot which is dragged by two horses. The chariot has two wheels and each wheel has about eight spokes. This type of chariot was used around 800 BC. Chariots figure prominently in the Rigveda, evidencing their presence in India in the 2nd millennium BC. They were most likely brought to the region by the Indo-European-speaking migrants from Central Asia, probably derived in part from their moving wagons. Among Rigvedic deities, notably Ushas (the dawn) rides in a chariot, as well as Agni in his function as a messenger between gods and men. There are a few depictions of chariots among the petroglyphs in the sandstone of the Vindhya range. Two depictions of chariots are found in Morhana Pahar, Mirzapur district. One is shows a team of two horses, with the head of a single driver visible. The other one is drawn by four horses, has six-spoked wheels, and shows a driver standing up in a large chariot-box. This chariot is being attacked, with a figure wielding a shield and a mace standing at its path, and another figure armed with bow and arrow threatening its right flank. It has been suggested that the drawings record a story, most probably dating to the early centuries BC, from some center in the area of the Ganges –Jamuna plain into the territory of still Neolithic hunting tribes. The drawings would then be a representation of foreign technology, comparable to the Arnhem Land Aboriginal rock paintings depicting Westerners. The very realistic chariots carved into the Sanchi stupas are dated to roughly the 1st century. The scythed chariot was invented by the King of Magadha, Ajatashatru around 475 BC. He used these chariots against the Licchavi. A scythed chariot was a war chariot with a sharp, sickle-shaped blade or blades mounted on each end of the axle. The blades, used as weapons, extended horizontally for a meter on the sides of the chariot. The earliest chariot burial site in China, discovered in 1933 at Hougang , Anyang of central China's Henan Province, dates to the rule of King Wu Ding of the late Shang Dynasty (ca. 1200 BC). But chariots may have been known before, from as early as the Xia Dynasty (17th century BC) . During the Shang dynasty, members of the royalty were buried with a complete household and servants, including a chariot, horses, and a charioteer. Shang chariot was often drawn by two horses, but four are occasionally found in burials. The crew consisted of an archer, a driver, and sometimes a third armed with a spear or dagger-axe. During the 8th to 5th centuries BC, Chinese use of chariots reached its peak. Although they appeared in greater number, infantry often defeated them in battle. Jacques Gernet claims that the Zhou dynasty, which conquered the Shang, made more use of the chariot than the Shang and "invented a new kind of harness with four horses abreast". The chariot became obsolete after the Age of the Warring States; the main reasons were the invention of the crossbow, the adoption of standard cavalry units, and the adaptation of nomadic cavalry (mounted archery), which was more effective. Chariots would continue to serve as command posts for officers during the Qin and Han Dynasty though. The Trundholm sun chariot is dated to ca. 1400 BC (see Nordic Bronze Age). The horse drawing the solar disk runs on four wheels, and the Sun itself on two. All wheels have four spokes. The "chariot" consists solely of the solar disk, the axle, and the wheels, and it is unclear if the sun is imagined as being itself a chariot, or as riding in a chariot. The presence of a model of a horse-drawn vehicle on two spoked wheels in Northern Europe at such an early time is in any case astonishing. In addition to the Trundholm chariot, there are a number of petroglyphs from the Nordic Bronze Age showing chariots, such as on one of the slabs of stone in a double burial from c. 1000 BC, showing a chariot with two four-spoked wheels drawn by a team of two horses. The use of the composite bow from chariots is not attested in northern Europe. 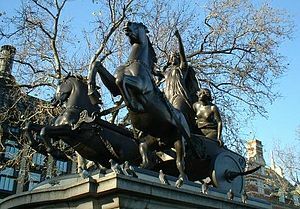 The Celts were famous chariot-makers, and the English word car is believed to be derived, via Latin carrum, from Gaulish karros (English chariot itself is from 13th century French charriote, an augmentative of the same word). Some 20 Iron Age chariot burials have been excavated in Britain , dating roughly from between 500 BC and 100 BC, virtually all of them in East Yorkshire, with the exception of one find of 2001 from Newbridge , 10 km west of Edinburgh . The Celtic chariot (may have been called carpentom) was drawn by a team of two horses, and measured approximately 2 m (6.56 ft) in width and 4 m (13 ft) in length. The one-piece iron rims for chariot wheels were probably a Celtic invention. Apart from the iron wheel rims and iron fittings of the hub, it was constructed from wood and wicker-work. In some instances, iron rings reinforced the joints. Another Celtic innovation was the free-hanging axle, suspended from the platform with rope. This resulted in a much more comfortable ride on bumpy terrain. There is evidence from French coins of a leather 'suspension' system for the central box, and a complex system of knotted cords for its attachment; this has informed recent working reconstructions by archaeologists. British chariots were open in front. Julius Caesar provides the only significant eyewitness report of British chariot warfare: "XXXIII.--Their mode of fighting with their chariots is this: firstly, they drive about in all directions and throw their weapons and generally break the ranks of the enemy with the very dread of their horses and the noise of their wheels; and when they have worked themselves in between the troops of horse, leap from their chariots and engage on foot. The charioteers in the meantime withdraw some little distance from the battle, and so place themselves with the chariots that, if their masters are overpowered by the number of the enemy, they may have a ready retreat to their own troops. Thus they display in battle the speed of horse, [together with] the firmness of infantry; and by daily practice and exercise attain to such expertness that they are accustomed, even on a declining and steep place, to check their horses at full speed, and manage and turn them in an instant and run along the pole, and stand on the yoke, and thence betake themselves with the greatest celerity to their chariots again." Chariots play an important role in Irish mythology surrounding the hero Cú Chulainn. The Celts in the Bronze Age used an ancient four-spoked wheel design called a sun cross or wheel cross to represent the chariot of the sun. The last mention of chariotry in battle seems to be at the Battle of Mons Graupius, somewhere in modern Scotland, in 84 AD. From Tacitus (Agricola 1.35 -36) "The plain between resounded with the noise and with the rapid movements of chariots and cavalry." The chariots did not win even their initial engagement with the Roman auxiliaries: "Meantime the enemy's cavalry had fled, and the charioteers had mingled in the engagement of the infantry." Herodotus reports that chariots were widely used in the Pontic -Caspian steppe by the Sigynnae. The only Etruscan chariot found intact dates to ca. 530 BC, and was uncovered as part of a chariot burial at Monteleone di Spoleto . Currently in the collection of the Metropolitan Museum of Art , it is decorated with bronze plates decorated with detailed low-relief scenes, commonly interpreted as depicting episodes from the life of Achilles . Possibly unique to Etruscan chariots, the Monteleone chariot's wheels have nine spokes. As part of a chariot burial, the Monteleone chariot may have been intended primarily for ceremonial use and may not be representative of Etruscan chariots in general. Greek chariots were made to be drawn by two horses attached to a central pole. If two additional horses were added, they were attached on each side of the main pair by a single bar or trace fastened to the front or prow of the chariot, as may be seen on two prize vases in the British Museum from the Panathenaic Games at Athens, Greece , in which the driver is seated with feet resting on a board hanging down in front close to the legs of the horses. The biga itself consists of a seat resting on the axle, with a rail at each side to protect the driver from the wheels. Greek chariots appear to have lacked any other attachment for the horses, which would have made turning difficult. The wheels and basket of the chariot were usually of wood, strengthened in places with bronze or iron. They had from four to eight spokes and tires of bronze or iron. Most other nations of this time had chariots of similar design to the Greeks, the chief differences being the mountings. The Romans probably borrowed chariot racing from the Etruscans, who would themselves have borrowed it either from the Celts or from the Greeks, but the Romans were also influenced directly by the Greeks especially after they conquered mainland Greece in 146 BC. In the Roman Empire, chariots were not used for warfare, but for chariot racing, especially in circi, or for triumphal processions, when they could be drawn by as many as ten horses or even by dogs, tigers, or ostriches. There were four divisions, or factiones, of charioteers, distinguished by the color of their costumes: the red, blue, green and white teams. The main centre of chariot racing was the Circus Maximus , situated in the valley between the Palatine and Aventine Hills in Rome. The track could hold 12 chariots, and the two sides of the track were separated by a raised median termed the spina. Chariot races continued to enjoy great popularity in Byzantine times, in the Hippodrome of Constantinople , even after the Olympic Games had been disbanded, until their decline after the Nika riots in the 6th century.The starting gates were known as the Carceres. Crouwel, Joost H. Chariots and other means of land transport in Bronze Age Greece (Allard Pierson Series, 3). Amsterdam: [Allard Pierson Museum], 1981 (ISBN 90-71211-03-7). Crouwel, Joost H. Chariots and other wheeled vehicles in Iron Age Greece (Allard Pierson Series, 9). Amsterdam:[Allard Pierson Museum]:, 1993 (ISBN 90-71211-21-5). Greenhalg, P A L. Early Greek warfare; horsemen and chariots in the Homeric and Archaic Ages. Cambridge [Eng.] University Press, 1973. (ISBN 9780521200561).